Look around the room, the country or the planet today, and the degree to which technology and innovation have permeated human existence may seem astounding. The question is—how are we as a people and world navigating this transformation? Has all this technology made us safer, stronger, smarter and more efficient or has it turned us into robot humans? 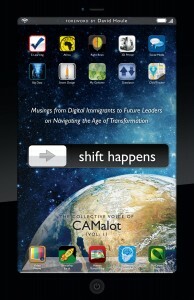 Shift Happens: Musings from Digital Immigrants to Future Leaders on Navigating the Age of Transformation explores this important question of whether technology today is uniting or dividing us. School kids text each other at the lunch table rather than talking to each other, as Gen X and Baby Boomer administrators look on in horror. Grandmothers marvel while simultaneously scratching their heads to see their two-year-old grandkids sliding images and icons around on smart phones and iPads. Depending on your vantage point, the vast array of technology available to us today can be overwhelming, awe-inspiring or just the reliable norm. In this relative context, how do we bridge the gap between those who are tech savvy and those who are technology-blind? How do we retain the wisdom of our elders while honoring the imagination and potential of our young people? Shift Happens brings together thought leaders of our time—professional coaches, nonprofit leaders, ministers and more—to address, wrestle with, and answer these questions. While some of the book’s contributors struggle to embrace today’s technology, others admire and respect it. In either case, by the very act of writing this book, each contributor ultimately participated in a grand experiment enabled only by technology, writing the book together within a single three-day period at the CAMalot conference in Braselton, Georgia in October. Each contribution—whether presented in the form of an essay, poem, letter, dialogue or fairytale—reveals valuable nuggets of wisdom to ponder as the human race shifts seemingly ever faster toward our future. Read it fast, or digest it slowly. Then read it to someone younger than you or gift it to someone older. We are all in this together. Let the dialogue between today’s thought leaders and the world’s next generation of leaders begin! Shift Happens: Musings from Digital Immigrants to Future Leaders on Navigating the Age of Transformation, The Collective Voice of CAMalot, Vol. 1, Bluefield Publishing/CAM Publishing, December 2012, 148 pp. (paperback), $16.95.